The Lightweight division has an interesting year ahead of them as it seems there always is in the best division in the UFC. For the last few years the lightweight division has seen the largest amount of talent out of any division in the UFC. It has also been one of the few divisions that has not been ruled by one fighter for a long time. The last three lightweight champions would all defend the belt three times before losing it in their fourth title defence. It has been extremely rare in the UFC for other divisions as no one fighters has ruled for very long. 2013 would not see a lot of action in with the lightweight championship as there would only be two lightweight title fights all year. One would be Benson Henderson defending his belt against Gilbert Melendez while the second would be the fourth title defence of Henderson. In what has become the typical path Henderson would lose the fight to Anthony Pettis bringing a new champion once again. Now a new year starts and more than any other weight class there are fighters waiting for their chance. The division is full of the best fighters in the UFC and all of them are trying to find their way to the top of the heap and unseat Anthony Pettis. There are plenty willing to challenge Pettis as old standbys and new up and comers are all looking for their piece of the UFC gold. Fighters like Bobby Green and Khabib Nurmagomedov are moving up the rankings and are getting a lot of people excited over their potential. They will likely have to wait though as TJ Grant waits to get healthy and take the opportunity he earned last year while Gilbert Melendez is looking for a second shot at the title. There are two more fighters looking for their chance to get to the top of the heap and both will take that step this week when they fight each other in an important lightweight fight. Benson Henderson and Josh Thomson are both among the top 5 in the division and are only one win away from a potential title fight. For Benson Henderson the fight means a chance to stay the #1 contender and earn a rematch against Anthony Pettis. 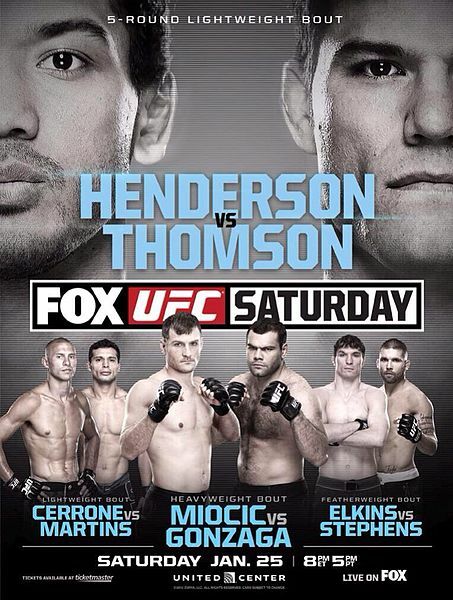 For Thomson it is a chance to achieve his potential that was seen when he first entered the UFC from Strikeforce. There will not be a lot separating the two fighters as both are very well-rounded and will not give up much in any spot in the octagon. Both fighters have good boxing but both are very durable with great chins as Henderson has never been KO’d while Thomson has only been KO’d once. Despite both of their talents on the feet it will be hard to end this fight while standing as neither fighter has the power to knock the other out. On the ground both fighters have the ability to end fights but Henderson has not finished a fight since entering the UFC and Thomson’s last finish was against Pat Healy in 2010. It is another area where both fighters are so good that they will cancel each other out as they will find it hard to finish the fight on the mat. It is going to be a tough one for both of these fighters as it will likely go all five rounds with the slightest edge winning this fight. That edge will go to Benson Henderson who will be just that much better in the stand up and on the ground to earn the win. It will not be a landslide though as Henderson will take the win with a split decision as they will go back and forth with either fighter taking rounds but it will be the former champion coming out on top. The lightweight division is the best in the UFC with changes happening regularly and plenty of fighters waiting for their chance. The heavyweight division could be the next best in the UFC as the championship continues to change hands while a number of fighters wait in the wings. In 2012 Stipe Miocic was one of these guys waiting in the wings to get his shot at the title. Then he would lose to Stefan Struve and the momentum he had built up had fallen away. Miocic still remains a top fighter and is ranked #8 in the heavyweight division but the fighter that seemed to be destined for a title shot needs a little more work to get there. With a big win against Roy Nelson in his last fight he is back on the path to getting to the top once again. His next step will be Gabriel Gonzaga who will be looking to regain his standing in the division after two straight wins and moving up to #12. It has been a while since Gonzaga’s name has been mentioned among the best in the division as he has not been able to string together too many wins in the last few years. Now on a two fight win streak Gonzaga is hoping to take out a higher ranked fighter to continue to move up the division and eventually get a title shot. Both fighters are hoping to move up and looking to capitalize on recent hot streaks but only one will come out on top. In one corner Gonzaga has the power and the ability to finish fights while in the other corner is a new breed of fighter that is well-balanced everywhere and uses his speed to his advantage. It will be another close battle with a lot on the line for both fighters as they hope to move up and not fall further back.